Microvascular alterations: Increase in E- Selectin expression, vasodilation, increased capillary permeability, extravasation and endoneural oedema which results in hypoxia. Metabolic alterations: Production of toxic factors such as cytokines, hyperglycaemia, hormone imbalance, hypoalbuminemia, amina acid deficiency and activation of proteolytic pathways. Electrical alterations: Ion channel dysfunction, cell depolarisation, inexcitability, altered calcium homeostasis and changes in excitation-contraction coupling. Bionenergetic failure: Anti-oxident depletion, an increase in reactive oxygen species, mitochrondial dysfunction and apoptosis. The endoneural edema resulting from increased permeability may impair energy delivery to the axon followed by axonal death. Direct toxic effects and mitochondrial dysfunction evoked by hyperglycemia may contribute to this process. Animal experiments also identified channelopathy as a cause of rapidly occurring but reversible neuropathy. Muscle Weakness: Predominantly in the lower extremities. This should be suspected if there is reduced limb movement following a painful stimulus to the distal limb. Flaccid weakness can be observed symmetrically. 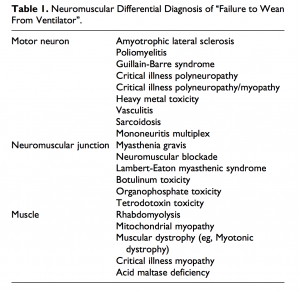 Absent Facial Weakness: Cranial nerves are rarely affected. Reduced Muscle Reflexes: Reflexes are usually present at the start of the disease, but decrease over time. Sensory Loss: Although difficult to assess with a sedated or intubated patient. This includes both nerve conduction studies and electromyography examination, however these resources are limited at a number of ICU's. Typically, nerve conduction studies highlight a reduced compound muscle action potential (CMAP) and in some instances the sensory nerve action potentials (SNAPs) may be reduced. Nerve conduction velocity is usually normal or minimally reduced. Currently there are no validated biomarkers available, creatine kinase and plasma levels of neurofilaments (a marker of axonal injury) are elevated in those with ICUAW, however the former not being a particular reliable biomarker as they are normal when muscle necrosis is absent or scattered which, with CIP, is commonly the case. Although not commonly performed, CIP will demonstrate features of denervation and reinnervation with small muscle fibers, fiber-type grouping, and fiber group atrophy with widespread axonal degeneration of both motor and sensory nerves. Muscle biopsy can display thick filament loss which is commonly associated with CIM, with evidence of denervation and reinnervation changes and axonal degeneration associated with CIP. Glycemic Control: Studies have shown that intensive insulin therapy for hyperglycemia lowered the risk of critical illness polyneuropathy and myopathy, and decreased time on ventilatory support, the duration of intensive care unit stay, and the 180-day mortality rate. Treatment of Sepsis: It is likely that adequate and early treatment of sepsis will reduce the incidence of CIP. Treatment modalities to reduce this risk are centered around the use of semi- recumbent positioning, use of low tidal volume mechanical ventilation, and no or careful use of sedative or neuromuscular-blocking agents. Neuromuscular Blockades: Risk factors for prolonged neuromuscular blockade in patients in the ICU include hepatic or renal failure, hypermag- nesemia, metabolic acidosis and the concomitant use of various antibiotics, especially aminoglycosides and clindamycin. Passive range of movement to maintain muscle length and prevent contractures due to prolonged bed rest. Active / active resisted exercises to improve strength and endurance. Positioning in bed to facilitate improved lung function. Sitting on edge of bed to facilitate trunk control / balance. Sitting out in chair to improve lung function (either via pat slide, hoist, standing hoist or transfers). Mobilising to improve lung function, cardiovascular fitness, muscle strength and promote independence. Kayambu et al (2013): Systematic review of 10 RCT's and 5 reviews. Physical therapy resulted in significant benefits in improving quality of life, physical function, peripheral and respiratory muscle strength and decreased hospital and ICU length of stays. Bahadur et al (2008): Those who participated in rehabilitation had decreased mortality rates and an increase in percentage of patients discharged from ICU. Chiang et al (2006): Group who performed upper and lower limb exercises with functional activities report an increase score in their functional independence measure and their maximum inspiratory pressure. GBS is an autoimmune disease of the peripheral nervous system that is typically progressive and symmetric with ascending paralysis, sensory abnormalities and areflexia, with 30% of patients requiring mechanical support . Never conduction tests highlights decreased velocity in GBS whereas normal conduction velocity and decreased action potentials. The stand out difference between CIP and GBS is that CIP is a part of critical illness that typically occurs during an intensive care stay, whereas GBS leads to an intensive care admission . Myasthenia Gravis: A rare, long term illness that commonly affects the muscles of the eyes and eyelids, facial expressions, chewing, swallowing and speaking and other parts of the body. 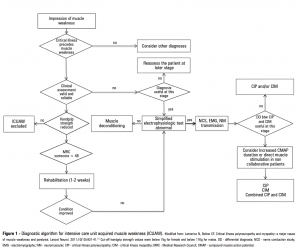 The development of a clinical management algorithm for early physical activity and mobilization of critically ill patients: synthesis of evidence and expert opinion and its translation into practice. ↑ Appleton, R. and Kinsella, J., 2012. Intensive care unit-acquired weakness. Continuing Education in Anaesthesia, Critical Care and Pain, 12(2), pp.62-66. ↑ Stevens, R.D., Marshall, S.A., Cornblath, D.R., Hoke, A., Needham, D.M., de Jonghe, B., Ali, N.A. and Sharshar, T., 2009. A framework for diagnosing and classifying intensive care unit-acquired weakness. Critical care medicine, 37(10), pp.S299-S308. ↑ 3.0 3.1 3.2 Zhou, C., Wu, L., Ni, F., Ji, W., Wu, J. and Zhang, H., 2014. Critical illness polyneuropathy and myopathy: a systematic review. Neural regeneration research, 9(1), p.101. ↑ 4.0 4.1 Hermans, G. and Van den Berghe, G., 2015. Clinical review: intensive care unit acquired weakness. Critical care, 19(1), p.274. ↑ 5.0 5.1 5.2 5.3 Visser, L.H., 2006. Critical illness polyneuropathy and myopathy: clinical features, risk factors and prognosis. European journal of neurology, 13(11), pp.1203-1212. ↑ Latronico, N. and Gosselink, R., 2015. 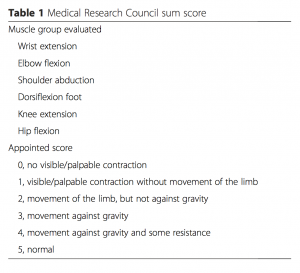 A guided approach to diagnose severe muscle weakness in the intensive care unit. Revista Brasileira de terapia intensiva, 27(3), pp.199-201. ↑ Latronico, N. and Bolton, C.F., 2011. Critical illness polyneuropathy and myopathy: a major cause of muscle weakness and paralysis. The Lancet Neurology, 10(10), pp.931-941. ↑ De Jonghe, B., Sharshar, T., Lefaucheur, J.P., Authier, F.J., Durand-Zaleski, I., Boussarsar, M., Cerf, C., Renaud, E., Mesrati, F., Carlet, J. and Raphaël, J.C., 2002. Paresis acquired in the intensive care unit: a prospective multicenter study. Jama, 288(22), pp.2859-2867. ↑ Wieske, L., Witteveen, E., Petzold, A., Verhamme, C., Schultz, M.J., van Schaik, I.N. and Horn, J., 2014. Neurofilaments as a plasma biomarker for ICU-acquired weakness: an observational pilot study. Critical Care, 18(1), p.R18. ↑ Hermans, G., De Jonghe, B., Bruyninckx, F. and Van den Berghe, G., 2008. 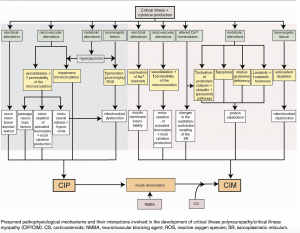 Clinical review: critical illness polyneuropathy and myopathy. Critical care, 12(6), p.238. ↑ Shepherd, S., Batra, A. and Lerner, D.P., 2017. Review of critical illness Myopathy and neuropathy. The Neurohospitalist, 7(1), pp.41-48. ↑ NICE (2009). Rehabilitation after critical illness in adults. Available at: https://www.nice.org.uk/guidance/cG83 [Accessed 12th June 2018]. ↑ Needham, D.M., 2008. Mobilizing patients in the intensive care unit: improving neuromuscular weakness and physical function. Jama, 300(14), pp.1685-1690. ↑ Kayambu, G., Boots, R. and Paratz, J., 2013. Physical therapy for the critically ill in the ICU: a systematic review and meta-analysis. Critical care medicine, 41(6), pp.1543-1554. ↑ Chiang, L.L., Wang, L.Y., Wu, C.P., Wu, H.D. and Wu, Y.T., 2006. Effects of physical training on functional status in patients with prolonged mechanical ventilation. Physical therapy, 86(9), pp.1271-1281. ↑ Rooney, K.A. and Thomas, N.J., 2010. Severe pulmonary hypertension associated with the acute motor sensory axonal neuropathy subtype of Guillain-Barré syndrome. Pediatric Critical Care Medicine, 11(1), pp.e16-e19. ↑ Pattanshetty, R.B. and Gaude, G.S., 2011. Critical illness myopathy and polyneuropathy-A challenge for physiotherapists in the intensive care units. Indian journal of critical care medicine: peer-reviewed, official publication of Indian Society of Critical Care Medicine, 15(2), p.78.